Organising a blogger meet up was probably one of the most fun, but nerve wrecking things I have ever done. And I really hope that the people who attended enjoyed the day as much as I did! We opted for a more low-key affair that some of the previous events still supporting local and upcoming brands but with more of a focus on blogger networking, making friends and learning new things. I've often felt out of my depth at blogger meet ups and consequently gone into myself or stuck to the people I know, and that's why we thought it'd be a great idea to create a bloggers 'bucket list' of fun activities and icebreakers. The checklists seem to go down well, and people were soon snapping selfies and Tweeting brands to win some gorgeous prints from That Lame Company. After a brief break from delicious snacks and hot drinks from the Liquid Jade tea bar, we changed the pace of the day by placing 3 chalk boards on the tables. Each board had a different topic of discussion: photography, social media and bloggers blog. They gave a chance to bloggers new and old to share their tips, tricks and experiences with each other. Needless to say I went home with a short shopping list after Violet recommended some Canon lens filters and Emma showed me her phone/SD card adapter! We ended the meet with some old #HullBloggers traditions with a raffle in aid of local charity Purple House and handing out some small goodie bags. In total we managed to raise £60 for the Hull-based women's centre as well as a car load of material donations for their charity shop - so thank you to everyone who contributed! 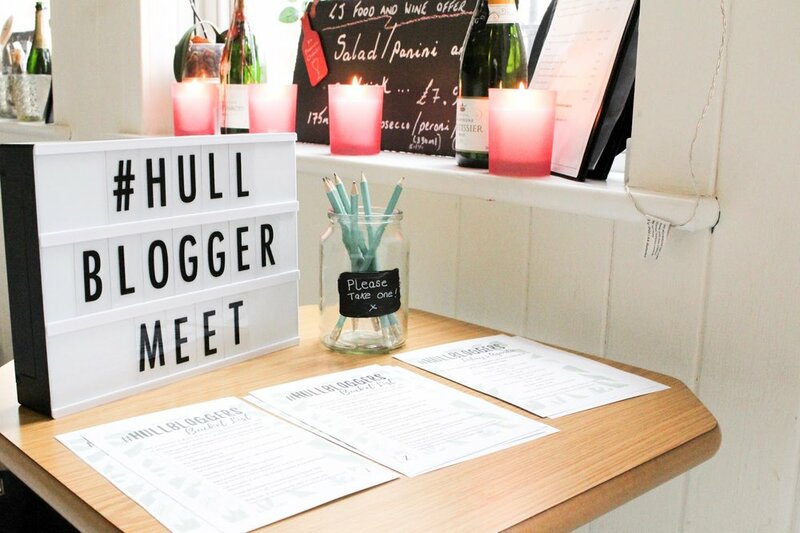 Have you ever organised a blogger meet? Or maybe just been an attendee? Let me know in the comments! 9 Reasons Why I love Autumn.